← Mia Jee Tandori & Juice Bar – Dinner – November 27, 2017 – K – Town, Los Angeles,CA. Dinner – Twohey’s Tavern – December 11, 2017 – Pasadena, CA. Twohey’s has quite the history with it being the original diner in Alhambra. A taste of nostalgia combined with the elevated flavors of today. 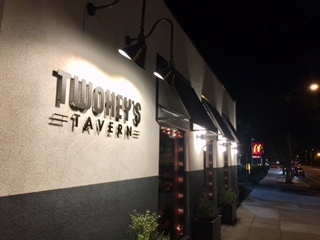 Towey’s Tavern opened on November 6th, 2017, from Greg Mallis and Tanya and Jim Christos, the three family members that kept the original Twohey’s name alive at the iconic 75-year-old Twohey’s Restaurant in Alhambra, which is a piece of Los Angeles history from the era of the Historic Route 66. With a tantalizing menu that playfully calls back to the classics. 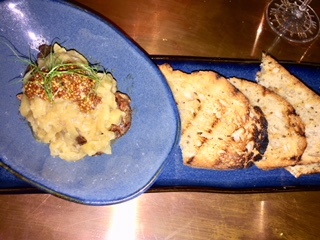 Chef Travis Limoge has a great gift for executing diner type menu items while honoring timeless and contemporary cooking techniques in a modern tavern setting. 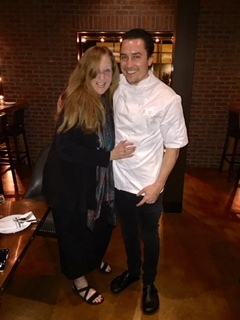 Born and raised in Vermont, Chef Travis Limoge grew up in the kitchen of his Grandfathers beloved restaurants, most notably Valley’s Steakhouse, where port wine cheese and broasted chicken were all the rage and weekend brunches were a showcase for his Grandmothers baking prowess, laying the inspiring groundwork for a future Chef. Upon moving to Los Angeles he became Chef de Cuisine at Fork in the Road in Santa Monica and Mardi at Palihouse in West Hollywood. After his grandmother passed he decided to take a trip to Mexico, exploring the flavors of the different regions and the restaurants of Alejandro Ruiz, father to modern Mexican cooking. A serendipitous meeting with Chef Ruiz at the airport led to a further five months in Oaxaca learning all about countryside cooking, in both taste and technique. When he came back to California the opportunity at Twohey’s became available, where he seized the chance to marry his passion for modern composition and the warmth of his grandmother’s table. “The nostalgia is in the taste, but the cuisine is now,“ Limoge says of his culinary philosophy at Twohey’s Tavern. Tanya Reyes welcomed me for my fun experience she came from Alexander’s Steak house. She is the general manager at Towhey’s Tavern, her smile and knowledge will keep you coming back for more. Traditional Vodka Martini, done in a coupe glass, very clear and perfect, my kind of Martini. The Heartbreaker, with Vodka, IPA reduction, cucumber, Hawaiian black sea salt, and lime. This is a very refreshing martini, with great cucumber essence. The Hawaiian black sea salt added just the right amount of seasoning to this glorious cocktail. Liver and onions/chicken livers, with caramelized onion, Worcestershire sauce, and sourdough. This is one of those dishes that could go very wrong if the liver was over cooked or if too much salt was added, but this dish is done to perfection with every detail covered. 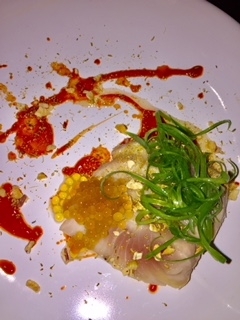 Pickled Yellowtail, with cider caviar, Fresno red hot, dehydrated apple, fennel pollen, and scallion. This is super fresh yellow tail, they give you four large slices, just enough to engage your palate. 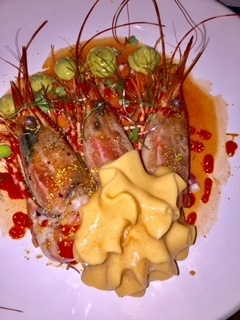 Shrimp coctel, with spot prawns, coctel aspic, michelada foam, Fresno red hot, avocado mousse. Large prawns with their heads on, truly the presentation is a work of art, but once you get one of these glorious succulent little beauties in your mouth you will see why this will become a must have every time you’re at Twohey’s Tavern. Kale, with baby kale, pipian vinaigrette, apple, pepitas, and fennel sprouts. Super healthy menu option, with very few ingredients but they all work so great together. Potato Salad, with fingerlings, orange, sage, grainy mustard, crème fraiche, horseradish, and cured yolk. 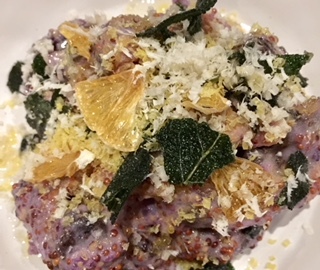 The Potato Salad is just the right amount of all of its parts, and the Peruvian purple potatoes, put this dish right out there in the stratosphere. Fried Chicken, with Half Rocky’s chicken, with braised greens, and wildflower honey. 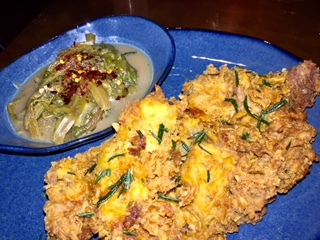 The Fried Chicken utilizes a half chicken without the bones and is accompanied by braised greens, cranberry beans, and Bill’s Bees wildflower honey. The breading is just off the charts with it super delicious seasonings, and crisp tender coating. 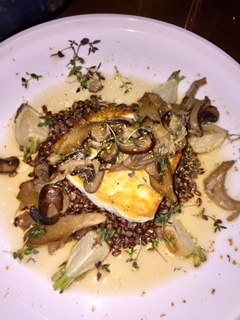 Santa Barbara Halibut, with juniper broth, wild mushrooms, toasted barley pearls, and roast turnip. Limoge also partners with Dock to Dish, all line-caught from Santa Barbara for most of his fish menu items. A nice woodsy dish with very smoky mushrooms with these delightful barley pearls. 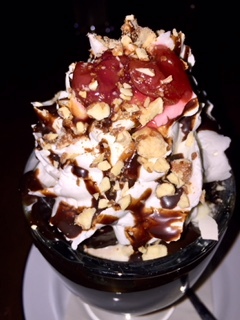 Twohey’s Famous Hot Fudge Sundae, this is the best Sundae ever. The fudge is super chewy ad when it lands on the ice cream is gets more lovely texture, what an amazing sundae, featuring the Original Twohey’s Bittersweet Fudge topping with whipped cream, roasted almonds and a cherry. Apple Tartan, such a gorgeous arrangement of fall leaves and apple vinegar flavors really worked as a nice ending to my very lovely experience. Vine Cliff/Chardonnay – Carneros, Ca. A nice light fruity Chardonnay that went great with the Shrimp Coctel. Jackhammer/Kristy’s Chardonnay – Monterey Ca. This is a very oaky chardonnay, with lots of buttery goodness; I loved this wine with the Halibut. Brave & Maiden/Cabernet Sauvignon – Santa Ynez Valley, Ca. I would try this wine with the Fried Chicken, it has a lot of smoky jammy characteristics that match the crisp breading of the fried chicken. Smokescreen/The Chemist-Paso Robles, Ca. This wine is a blend with some pepper nuances; I loved this with the Liver and Onions, especially the sweetness of the onions. The décor is very inviting, with copper topped tables and grey wood wainscoting. 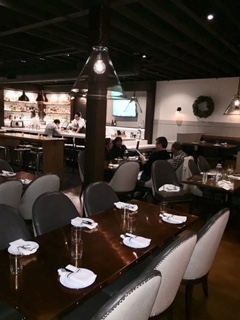 The light fixtures are upside down glass cones as well as industrial copper hanging fixtures. The bar is lively with a flat screen TV for sports events. The lighting is bright but warm and the modern feel makes this place truly enticing. Twohey’s Tavern is open for Dinner every Sunday through Thursday from 5:00 pm to 10:00 pm and the Bar is open from 5:00 pm to 11:00 pm. 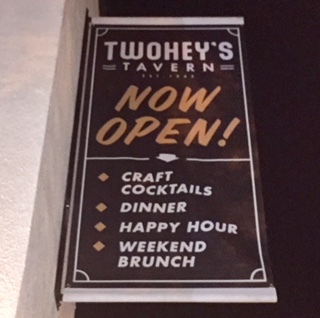 Twohey’s Tavern is open for Dinner every Friday and Saturday from 5:00 pm to 11:00 pm and the Bar is open from 5:00 pm to 12:00 Midnight.